Hi, everyone. As I mentioned in the title, today entry will be about the countdown for my birthday. Who's on the earth who didn't excite when their special day is coming, right? Including me. Maybe some of you might be new in this blog. 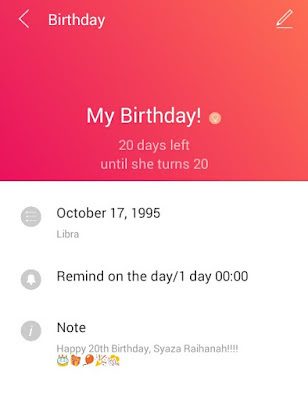 So, I would like to mention that I will turn to 20 on upcoming 17th October. To be honest, I'm quite excited yet scared to enter 20's life. You know, the feelings getting older and experience new thing in life. But, it's okay. Everyone will experience the same thing, right? But maybe some of us didn't care about the age cause it just a numbers. Yeah, it depends on. Everyone have their own opinions. 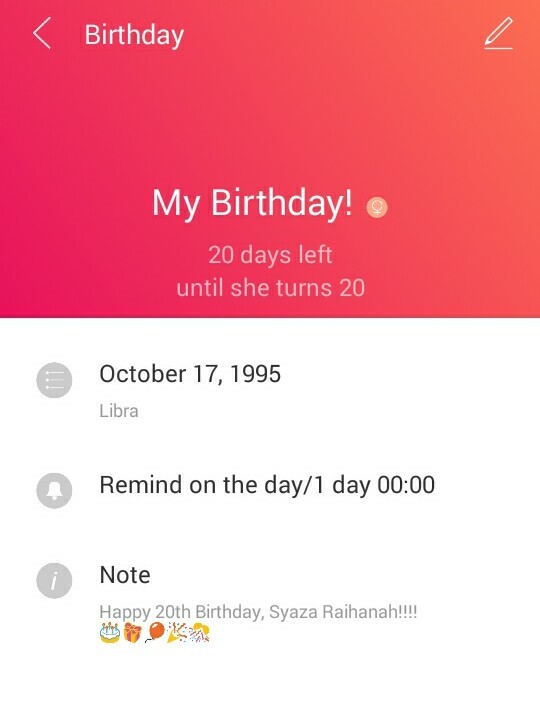 As for now, 20 days left before I turn 20. I'm not feeling well today. Fortunately, my college will be closed due to haze. So, I will use that time to rest. Thanks for reading! The big turnover from the teens to adulthood! Wooohoo! Just something I'd like to let you know. Treasure every SINGLE moment of your 20's. It will be the BEST time of your ENTIRE life!!! Celebrate and cherish each precious moment! God bless you! whoop whoop ! welcome to twenties. let's be a girl ! hehe. happy birthday in advanced syaza!